This week’s Photohunt theme is Shadow. I had several ideas right off on this so I went hunting to find them. Along the way, I stumbled up this set of photos taken on our trip to Western Australia. 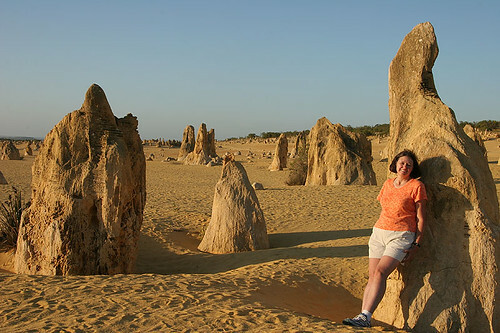 North of Perth is a popular attraction called the Pinnacles. 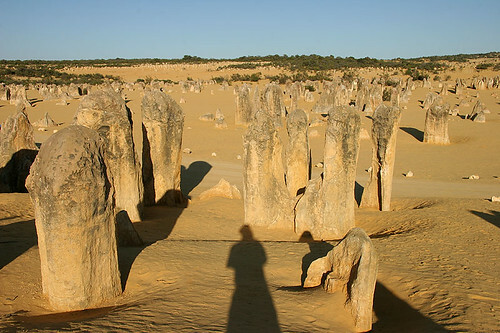 Nambung National Park is a great place to go at sundown (or sunrise) to capture the shadows off the unusual rock formations. 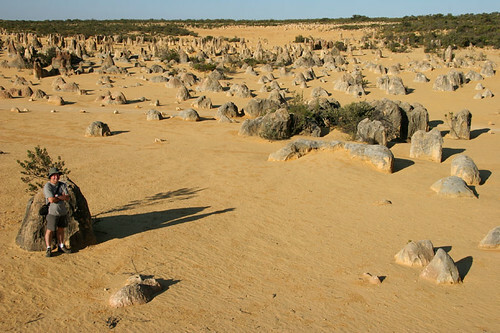 These were formed from ancient sea shells that were broken into sand and blown inland. 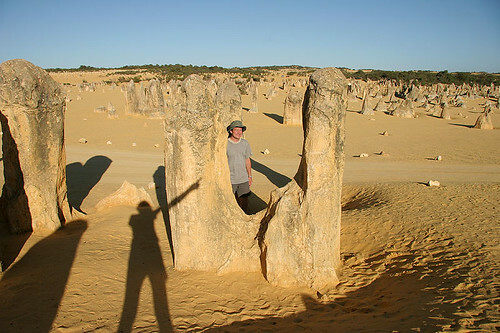 The rains washed away the lime and cemented the sand into these unusual limestone formations. We were staying just north of here in Jurien Bay. We drove late in the afternoon to the park to watch the shadows lengthen and grow until they turned the rocks into silhouettes. stunning landscape. what a fascinating post. What a cool place and your photos are awesome… Love them all and especially that sunset. 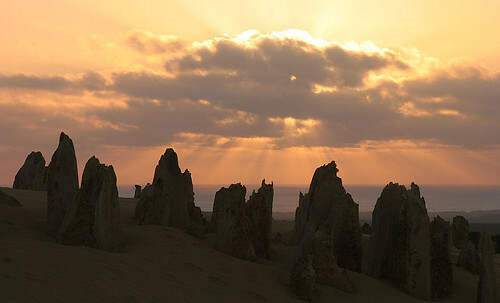 beautiful pinnacles and great take on the theme. i’ve always enjoyed your travel photos. Very interesting post. I enjoyed it very much, but I have to say the last shot at sunset is probably my very favorite. Great shadows! Have you been following @wheresandrew’s tweets? He’s in Perth today. 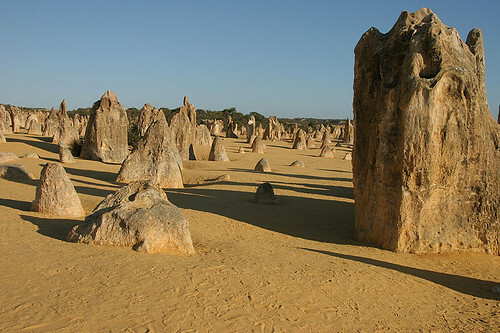 It reminds me of Goblin Valley in Utah, only spikier. Definitely a place I’d like to check out. Love your shadow, especially where you are pointing. What a beautiful place. Now that is somewhere I would love to visit! What a wonderful place to explore and perfect for the shadow theme. I enjoyed these shots very much. Stunning shadows!! I always love your travel shots, they are always so interesting. The last shot is beautiful! Thanks for stopping by, have a happy week end. Such a fantastic collection for this week’s theme. I especially like that you used them in a sequence. Sounds like it was an interesting trip. Ty and I always put Australia on our list of places to visit …. Not only beautiful pictures but also a very interesting post ! I didn’t know this park at all ! and what is so strange, I have seen a similar one in Turkey only the rock colors were different, they were grey and also bigger, but the shapes were the same ! WOW! I knew you would have fabulous shadows! I love the last photo! Wow! What a cool place!! LOVE your shadow self portrait photo. Great post.